Jesus told His Disciples, "This is to my Father's glory, thay you bear much fruit, showing yourselves to be my disciples." I think it is pretty obvious to conclude, then, that the Lord wants to see results. This fact was typified in Jesus' Parable of the Talents in the gospels of Matthew and Luke where the master wanted to see a good return from the investment he made in his servants.Whether we are speaking about our calling, ministry, home, business, hobby, or our personal life, we are no different. We would all like to see positive results in all our endeavors. It is through Paul also that God wants His children not to grow weary in doing well, for in due season they will reap, if the faint not. 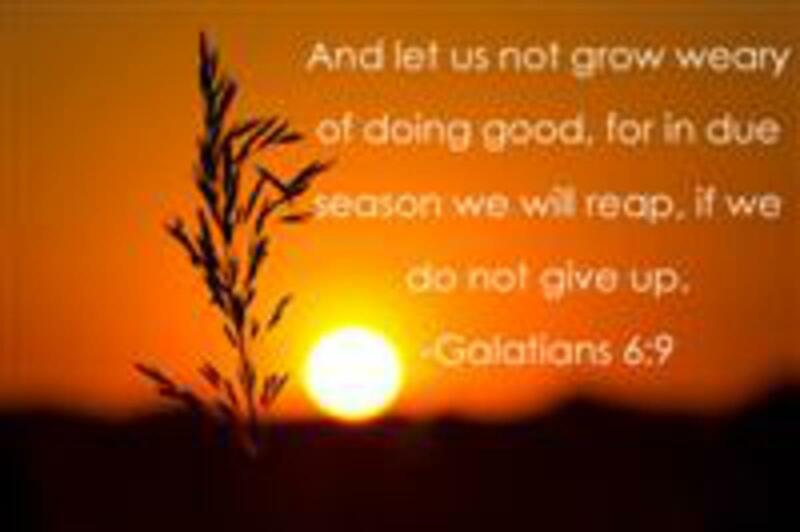 (Galatians 6:9) He also reminds us in 1 Corinthians 15:58 not to waver but to be steadfast, always abounding in our service to God, remembering that what we do for Him is what we do for others. Some of us are spoiled or just plain happy recipients of God's mercy because we do see fruit in our calling. In fact, many of you provide that for me by way of your thoughtful and kind words of encouragement concerning this blog. I realize, however, that some of you keep on doing good things and hardly ever get recognized and seldom get a word of thanks or a pat on the back. Nevertheless, here's a promise from God to you: Nothing that you are doing or have ever done because you love the Lord, will ever be in vain. Keep on going; don't give up! Others may never tell you, but I definitely appreciate you. I hope you'll join the ranks of those who have been blessed to see some good results for their efforts, and get the added blessing of hearing it from people's lips, but if you don't, remember that the Lord is seeing all you are doing and one day you will hear Him say: "Well done, my good and faithful servant." Meanwhile, why not find someone today who may need a word of thanks or encouragement, or maybe just a simple "I love you."